Visitors to fast food outlets in Japan will soon be able to pay for their burgers with their mobile phones. Japanese mobile phone operator NTT DoCoMo is teaming up with McDonalds to offer electronic payments and special promotions for mobile users. Using mobile phones to pay for goods is a massive growth area as operators look for new ways to make money. Japanese mobile owners are leading the way, paying for food and train tickets via their handsets. For Julie Ask, an analyst with research firm Jupiter, the partnership illustrates the need to have upfront agreements and co-operation for the chain needed for electronic payments to be a success. "Otherwise it suffers from the chicken and egg problem. POS [Point of Sale] equipment is needed to interoperate with technology in the cell phones. Carriers and handset manufacturers need incentives to add cost into the cell phones. There has to be a network for it to be interesting to anyone," she said. The deal could also provide invaluable information about customer behaviour, she said. 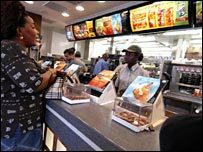 "It gives both McDonald's and DoCoMo the opportunity to track consumers and their eating habits. Cash is more likely to be used in small transactions. Electronic payments will allow user behaviour to be tracked and used for marketing purposes," she said in her blog. Increasingly mobile phone operators are experimenting with electronic payments. In the UK, YourRail is working with Chiltern Railways to offer commuters the chance to buy tickets with their mobile phones. Users buy their ticket on the internet and it is delivered to their mobile phone in the form of a barcode. Gates are currently being installed at Marylebone station which will scan phones. In Japan, DoCoMo set up a service which allows customers to use their handsets as a credit card. By April there were around 3m wallet phones in Japan using a pre-paid credit system where users topped up their account, often via a website, before using their phone to pay for something. The joint venture between McDonalds and DoCoMo - worth 300 million yen - will see McDonalds Japan holding a 70% stake, with DoCoMo owning the rest. It is due to begin in July of this year.